We should perhaps get clear from the start that the Mr. White in question here is named Herbert, not Walter. He is not a brilliant meth dealing chemist, but rather a lonely photographer with some memory problems. And the setting is not the hot desert landscape of New Mexico, but the chill winter landscape of St. Paul, Minnesota. It is 1939. Detective Wesley Horner notices Herbert before he actually suspects him of anything. They both find themselves eating in a White Castle café and even then Horner is struck by Herbert’s oddity: “He sat, balding and rotund, on his stool, like an egg in an egg cup”. Horner and his partner don’t have long to speculate about him, though, because the next thing you know, they are on the scene of a crime. A young woman has been murdered and she’s not the only “dime a dance girl” found dead. Before too long, it’s clear that Herbert White is the prime suspect. This novel is set up as a classic noir crime story, and it won an Edgar award on that account, but it is actually something different. As a pure mystery, it is not completely satisfying. It’s not aiming to be. And this is because the confession of Mr. White is a different kind of confession than you usually find in a crime novel. This question would not be irrelevant to Herbert White, who has no problem with short term memory nor with recalling the distant past. It’s the middle range he finds problematic. In order to keep track of that middle range, he has resorted to writing down what has happened to him in a series of notebooks, passages of which are interspersed with Horner’s tale of detection. Unfortunately, this routine doesn’t help White much when it comes to the crunch. The classic detective story is said to be popular because it offers the reader catharsis—the crime is solved, the killer caught. This novel doesn’t play by those rules, and by those standards, some will find it unsatisfying. Clark has other fish to fry here. 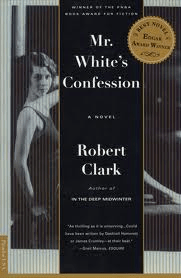 If you’re willing to forego the pleasure of a twisty ending though, I am pretty sure that you will find Clark’s novel pleasing on other, deeper levels.